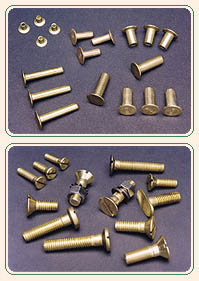 Keystone Screw Corporation manufactures all of its automotive fasteners to exacting standards. Keystone's brake bolts are made from high strength steel and brass to enable maximum torque without field failure. Keystone's quality control program painstakingly exams every bolt and rivet to assure that each meets the specifications of its intended application. Bolts are packaged 100 per box. Rivets can be supplied in packages of 1,000 or in bulk cartons. Personalized labeling is also available. In production quantities, Keystone can also imprint your logo on the head of the rivet. 82° FLAT 3/16" 3/4" - 1-1/4"
120° FLAT 5/16" 1" - 1-1/2"
120° FLAT FILLISTER 3/8" 1-1/4" - 2-1/2"
120° FLAT 5/16" 1" - 1-1/4"
3-3 3/16" 5/16" (.289-.303) 9/64" (.140-.146) .138"
4-4 1/4" 5/16" (.289-.303) 9/64" (.141-.146) .125"
4-4.5 9/32" 5/16" (.289-.303) 9/64" (.141-.146) .125"
5/16" 5/16" (.289-.303) 9/64" (.141-.146) .125"
4-6 3/8" 5/16" (.289-.303) 9/64" (.141-.146) .125"
5-3 3/16" 3/8" (.351-.367) 9/64" (.141-.146) .125"
5-4 1/4" 3/8" (.351-.367) 9/64" (.141-.146) .125"
5-4.5 9/32" 3/8" (.351-.367) 9/64" (.141-.146) .125"
5-5 5/16" 3/8" (.351-.367) 9/64" (.141-.146) .125"
5-6 3/8" 3/8" (.351-.367) 9/64" (.141-.146) .125"
5-7 7/16" 3/8" (.351-.367) 9/64" (.141-.146) .125"
5-8 1/2" 3/8" (.351-.367) 9/64" (.141-.146) .125"
5-10 5/8" 3/8" (.351-.367) 9/64" (.141-.146) .125"
5-12 3/4" 3/8" (.351-.367) 9/64" (.141-.146) .125"
7-3 3/16" 3/8" (.351-.367) 3/16" (.182-.188) .187"
7-4 1/4" 3/8" (.351-.367) 3/16" (.182-.188) .187"
7-5 5/16" 3/8" (.351-.367) 3/16" (.182-.188) .187"
7-6 3/8" 3/8" (.351-.367) 3/16" (.182-.188) .187"
7-7 7/16" 3/8" (.351-.367) 3/16" (.182-.188) .187"
7-8 1/2" 3/8" (.351-.367) 3/16" (.182-.188) .187"
7-9 9/16" 3/8" (.351-.367) 3/16" (.182-.188) .187"
7-10 5/8" 3/8" (.351-.367) 3/16" (.182-.188) .187"
7-12 3/4" 3/8" (.351-.367) 3/16" (.182-.188) .187"
7-14 7/8" 3/8" (.351-.367) 3/16" (.182-.188) .187"
7-16 1" 3/8" (.351-.367) 3/16" (.182-.188) .187"
8-6 3/8" 1/2" (.458-.478) 3/16" (.182-.188) .187"
8-7 7/16" 1/2" (.458-.478) 3/16" (.182-.188) .187"
8-8 1/2" 1/2" (.458-.478) 3/16" (.182-.188) .187"
8-9 9/16" 1/2" (.458-.478) 3/16" (.182-.188) .187"
8-10 5/8" 1/2" (.458-.478) 3/16" (.182-.188) .187"
8-11 11/16" 1/2" (.458-.478) 3/16" (.182-.188) .187"
8-12 3/4" 1/2" (.458-.478) 3/16" (.182-.188) .187"
8-14 7/8" 1/2" (.458-.478) 3/16" (.182-.188) .187"
8-16 1" 1/2" (.458-.478) 3/16" (.182-.188) .187"
10-6 3/8" 1/2" (.458-.478) 1/4" (.244-.252) .250"
10-7 7/16" 1/2" (.458-.478) 1/4" (.244-.252) .250"
10-8 1/2" 1/2" (.458-.478) 1/4" (.244-.252) .250"
10-8.5 17/32" 1/2" (.458-.478) 1/4" (.244-.252) .250"
10-9 9/16" 1/2" (.458-.478) 1/4" (.244-.252) .250"
10-10 5/8" 1/2" (.458-.478) 1/4" (.244-.252) .250"
10-11 11/16" 1/2" (.458-.478) 1/4" (.244-.252) .250"
10-12 3/4" 1/2" (.458-.478) 1/4" (.244-.252) .250"
10-13 13/16" 1/2" (.458-.478) 1/4" (.244-.252) .250"
10-14 7/8" 1/2" (.458-.478) 1/4" (.244-.252) .250"
10-15 15/16" 1/2" (.458-.478) 1/4" (.244-.252) .250"
10-16 1" 1/2" (.458-.478) 1/4" (.244-.252) .250"
10-17 1-1/16" 1/2" (.458-.478) 1/4" (.244-.252) .250"
10-18 1-1/8" 1/2" (.458-.478) 1/4" (.244-.252) .250"
10-19 1-3/16" 1/2" (.458-.478) 1/4" (.244-.252) .250"
10-20 1-1/4" 1/2" (.458-.478) 1/4" (.244-.252) .250"
10-21 1-5/16" 1/2" (.458-.478) 1/4" (.244-.252) .250"
10-22 1-3/8" 1/2" (.458-.478) 1/4" (.244-.252) .250"
10-23 1-7/16" 1/2" (.458-.478) 1/4" (.244-.252) .250"
10-24 1-1/2" 1/2" (.458-.478) 1/4" (.244-.252) .250"
11-6 3/8" 3/8" (.351-.367) (.151-.156) .250"
17-3 3/16" 3/8" (.351-.367) 3/16" (.182-.188) .140"
17-4 1/4" 3/8" (.351-.367) 3/16" (.182-.188) .197"
17-5 5/16" 3/8" (.351-.367) 3/16" (.182-.188) .252"
17-6 3/8" 3/8" (.351-.367) 3/16" (.182-.188) .310"
20-8 1/2" 1/2" (.458-.478) (.191-.198) .187"
20-8.5 17/32" 1/2" (.458-.478) (.191-.198) .187"
20-9 9/16" 1/2" (.458-.478) (.191-.198) .187"
20-10 5/8" 1/2" (.458-.478) (.191-.198) .187"
22-4 1/4" 5/16" (.289-.303) 9/64" (.141-.146) .187"
22-5 5/16" 5/16" (.289-.303) 9/64" (.141-.146) .187"
22-6 3/8" 5/16" (.289-.303) 9/64" (.141-.146) .187"
23-4 1/4" 3/8" (.351-.367) (.208-.212) .157"
23-5 5/16" 3/8" (.351-.367) (.208-.212) .157"
23-6 3/8" 3/8" (.351-.367) (.208-.212) .157"
24-4 1/4" 3/8" (.351-.367) 3/16" (.182-.188) .141"
24-4.5 9/32" 3/8" (.351-.367) 3/16" (.182-.188) .141"
24-5 5/16" 3/8" (.351-.367) 3/16" (.182-.188) .141"
24-5.5 11/32" 3/8" (.351-.367) 3/16" (.182-.188) .141"
24-6 3/8" 3/8" (.351-.367) 3/16" (.182-.188) .141"
24-7 7/16" 3/8" (.351-.367) 3/16" (.182-.188) .141"